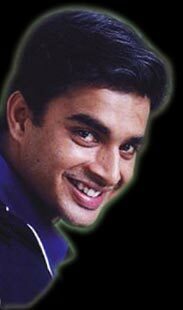 Madhavan, a popular T.V. star was introduced by Maniratanam in Alai Payuthey (in Telugu, Sakhi) and now he is a sensation among the teenagers. He has become a TDH (Tall, Dark &Handsome) hero of Mills and Boons for the teenage girls. His next movie is Ennavale (in Telugu Ninnu Chuuseka) with Sneha, which will be shortly released. Let's chat with this charming hero. How did Maniratnam spot you? I have always dreamt to act in movies. But I didn't get the opportunity. So, I satisfied myself by acting in serials. My first serial was Banegi Apni Baat, which brought me good name. I have done 42 serials. I forgot about the movies and thought anyway, acting is acting, so what if in serials. Suddenly one day I was invited by Maniratnam to act in his forthcoming movie, Sakhi. That is how I entered into movies. To act in Maniratnam's movies is every actor's dream. How did you feel working with him? I can't express in words. I love his movies. He is one of my favorite directors. I have watched all of his movies. There was no end to my happiness, when I was working with my favorite, Maniratnam. My situation was similar to that of an intermediate student, who is invited by Bill Gates to work in his software company on a big post. For a week I could not come out of the hang over. My working with Maniratnam would be a sweet and unforgettable event in my life. What did you feel while doing Sakhi? Keeping aside the fact that success of Sakhi is a good start of my career, I was actually identifying myself with the movie, excluding the accident part. I did not feel that I was working in a movie and I enjoyed every bit of it. Which is your favorite scene in the movie? I liked the scene in which I talk to Shalini in my flat. You might be wondering which scene it could be? That scene is not there in the movie. That scene was cut down, as the movie had become too lengthy. But still that scene is my favorite one. Tell us something about the fan mail you got after Sakhi was released? If I tell about it, you might think that I am boasting. Ask my wife! She is the one who handles my fan mails. I got 500 e-mails, letters written in blood and many more letters. And surprisingly, most of them were from Andhra Pradesh. The release of Sakhi has made you a craze, especially among the teenagers. How do you feel about it? For the shooting of Sakhi, we went to Kashmir. There many people came and every one was taking autographs of Shalini and no body paid attention to me. You know, I felt sad. But after the release of Sakhi, when I go out for shooting, all the fans come for my autograph without paying any attention to the heroine with me. What kind of mails do you get from your fans? Generally, most of them say that they love me and they want to marry me. Then, did you say ' yes' to any of your fans? (Laughs) I would have said 'yes', if I was not married. How are you planning your career? Well, I don't believe in planning. I am a graduate in Electronics but today I am a hero in movies. My education has nothing to do with my career. So, I never plan. Q. with a director like Mani Ratnam. How has the experience been? Ans. "Very Thrilled" is an understatement. I was absolutely ecstatic. I probably felt like how a 12th standard computer student would have felt when suddenly asked to come and work with Bill Gates...Ha Ha Haaa...Seriously, it was the single most rewarding experience of my life. I was thrilled and honored to be selected for the part. I hope and pray that more and more sincere actors get to experience the phenomena that in Mani Sir. Q. Did you enjoy playing the character delineated by the director - how much of him could you identify with ? Ans. I thoroughly enjoyed every minute of the shoot. The sad part for me is that the shoot got over. I was having such a ball. I completely lived the character that I was asked to essay. Identified with most of his emotions and later to my surprise discovered that in real life I was almost exactly like him. I went through almost all that he goes through except for the climax of the film. Q. What do you think are the aspects that stand out in Mani Ratnam ? Ans. I have been a die-hard fan of Mani Sir's work, so I admit that my opinion will be shamelessly bias. Despite that what really struck me was his sheer passion, dedication and single minded devotion for his work. Where work is concerned the energy he has is almost super human. Just being in his presence for me was inspiring and a motivation. Q. Did you always want to act in films ? Can you tell us something about yourself ? by qualification. I was selected to represent India asa cultural exchange student in Canada, through Rotary International in 1989.
here till as long as I enjoy myself. Q. How has it been to work with someone like Shalini, who is considered as one of the best actresses of the South ? Ans. The experience has been great and unforgettable. She is definitely one of the more capable actresses and an amazing dancer. and I grateful to them for that. Q. Now that the film is over what is coming next ? Another Mani Ratnam film ? Ans. Your guess is as good as mine. I am waiting for the film to release with bated breath. Once that happens I will decide what to do. I have had some great offers and I am waiting for things to materilise before I speak about them. As for another Mani Ratnam film. I'd lover to ba a part of it anytime. I hope he has something for me, You will have to ask him about it. Q. Would you be doing film in other languages also - perhaps in Hindi ? to a project. Also I am very fluent in Hindi, so if a good story comes along I will definitely do it. An electronics graduate, Madhavan was selected to represent India as a cultural exchange student in Canada, through Rotary International in 1989. He has won the National Championship for Public Speaking, organised by the Junior Chambers and was selected to represent India at the Young Businessmen Conference in Tokyo, Japan in 1992. We began the interview with a refreshing coffee. I am an electronics graduate. I was selected to represent India as a cultural exchange student in Canada, through Rotary Internationalin 1989. After that I was selected the Best NCC (National Cadet Corp) Cadet in Maharashtra and sent to represent India at England as a defence cadet with the Royal Army, Navy and Airforce. I also won the National Championship for Public Speaking, organised by the Junior Chambers and was selected to represent India at the Young Businessmen Conference in Tokyo, Japan in 1992. After this, based on my experience I started teaching Public Speaking and moved to Mumbai in 1993-94. There, one of my students suggested I try modelling, as it would give me fast money to set up my own office in Mumbai. I took his advice, mailed my snaps to a few people, got into Television. And four years later landed a film with Mani Sir. Whew...some journey eh...but now that I am here, I intend to stay here as long as I enjoy myself. Did you always want to act in films? I never, not even in my wildest dreams, thought that I would act in films, and a Mani Ratnam film at that. It still seems like a dream to me. Have your personality development classes helped you? Yes, it has helped. It has helped me in romances in real life. It also contributes a lot to my acting today. With a director like Mani Ratnam, what has your experience been? "Very Thrilled" is an understatement. I was absolutely ecstatic. I probably felt like how a 12th standard computer student would have felt when suddenly asked to come and work with Bill Gates...(laughs)...Seriously, it was the single most rewarding experience of my life. How much of your character in the movie could you identify with? I thoroughly enjoyed every minute of the shoot. The sad part for me is that the shoot got over so soon. I was having such a ball. I completely lived the character that I was asked to assay. Identified with most of his emotions and later to my surprise, discovered that in real life, I was almost exactly like him. I went through almost all that he goes through except for the climax of the film. If you critically assess your performance in Alai Payuthey, did you find anything lacking? Nothing. All the credit goes to Mani sir. I did what he told me to do and it has come out well. Did you go to the theatres to see the audience's reaction? Yes. I went four to five times to Devi Theatre. I was wearing a beard and glasses. No one recognised me. Which scene in the movie did the crowd enjoy most? I don't know. Some girls were whistling, so I closed my eyes. So, you are the latest heartthrob. How does it feel to be one? Well it is very flattering. I do get embarrassed sometimes by all this hype. How do you feel when people call you the Hrithik Roshan of the south? They are so kind. But Kaho na pyaar hai ran because of Hrithik, while in my case it was a team effort and the genius of Mani sir. Has this stardom affected your privacy? Very much. I miss going in trains and stuff like that. But I take it in my stride. I feel I am still the same person. Nothing has changed as far as I am concerned. I still dress the same way I did before. Would you be doing films in other languages also - perhaps in Hindi? I'd love to do any film, provided I am excited about the script. Even a Japanese film, provided I like the story line and my character. Also, I am very fluent in Hindi, so if a good story comes along, I will definitely do it. What are the current projects you are working on? I am doing a film called Minnaley,directed by Goutham Menon. And one more film, tentatively titled Dhool. I am doing the next film of Madras Talkies. On what criteria do you select a film? I first see how convincing the director is about the subject. Then how much I like my role. Total sincerity of the project and the storyline are also important. Which is your favourite landmark in Chennai? Well, my favourite place happens to be my home. (pauses) I love Marina beach. I love walking there. What are your plus points and negative points? I read people very well and am very adaptable. I tend to be finicky and choosy. Also impatient, I get a little irritated when people cannot keep pace with me. If God were to give you a boon, what would you ask for? I will ask for 12 hours sleep, every day. Your idea of a romantic getaway? Somewhere in the mountains, with my wife, for a couple of days. Now that you have made it big in the south, do you plan to settle here? I am a vagabond. Let me see where life takes me. If looking good is the first step to making it big in films then Madhavans home already. His compelling screen presence, combined with his histrionic talent already showcased through Hindi TV serials plus a dream debut in a Manirathnam film gave him the right passport to instant stardom. Madhavan is riding the crest of popularity now with five films already up his sleeve. 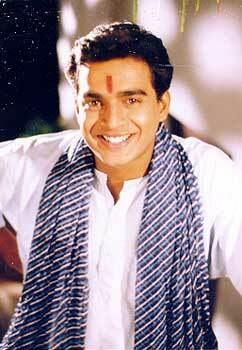 I found post-Alaipayuthe Madhavan the same balanced, down to earth person with no hang-ups. How does he feel about the phenomenal hype following the success of Alaipayuthe? "Awestruck! ", he says. And to what does he attribute the success of the film? Pat came the reply : "Hundred percent to Maniratnam Sir". The euphoria still lingers, "I still havent absorbed it all completely", he added flashing that now-famous oh-so-naughty smile. 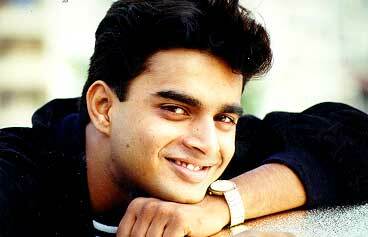 Madhavan then went on to talk about himself, the making of Alaipayuthe, his stardom, aspirations, passions etc. Q: Was it the English TV Serial A Mouthful of Sky that brought you into limelight? A: There is a very big difference between the two. On TV you might put your heart and soul into one episode of a serial, put in your best performance of your life in that. While it is being telecast if you get a phone call or you have unexpected guests, you miss its as transient as that. But in films you are glued for three hours and get totally involved with it. People come and tell you in great detail about your performance. Nobody comments on your performance as an actor on TV. People comment on the programme as a whole. Very few even remember the name of the artist. A: I had mixed feelings when I didn't get through. But meeting Mani Sir was exciting enough. When I got his call for a screen test for 'Alaipayuthe' I felt like a computer-crazy 12th standard student getting a call from Bill Gates! It was a mixture of excitement, awe, fear, expectations - everything. Even if he had offered me a miniscule role I'd have been thrilled. I think I'm the first newcomer ever he cast in the main lead in his film. Thats such an honour. A: Absolutely. But if you are a dedicated person he is the easiest person to get along with. I loved to be a part of his thinking process on each shot. I have learnt quite a bit about the technical aspects of film-making from him. I even learned the entire script of Alaipayuthe, irrespective of whether I was in the scene or not! Mani Sir inspires that sort of involvement and dedication in you. A: I have been choosy during the last two years. Its not ego. I'm simply applying business sense. Where 'Alaipayuthe' is concerned Maniratnam was the selling proposition, not Madhavan. P.C.Sreeram, A.R.Rahman and he are the stars of that film. Only if I do well in my next three films will I become a saleable commodity. I have signed up five films now, including one with Madras Talkies.